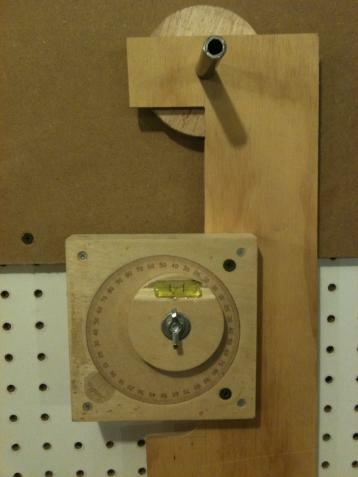 Use a vernier protractor, I-phone, or digital angle gauge to divide a circle into perfectly spaced increments. An old problem in woodworking geometry is to divide a circle into equal parts. This task is not too bad if the circle is to be divided into 2,4,or 8 increments, but other numbers are notoriously difficult to divide accurately. Simple protractors are good to about 1° or perhaps 1/2° if they are large enough. You can use my vernier protractor, a digital angle gauge, or even an I-phone in conjunction with the method described on this page to divide a circle accurately into any number of divisions with good accuracy. I prefer my vernier protractor not only because I made it, but it also has a scale that reads from 0 to 360° instead of the typical 0-90-0 or 0-180° used on all the digital gauges and I-phone applications I have seen. Using a precision vial also eliminates jittery readings. The mechanical device is also more reliable and there is not much that can go wrong with it. Level vials are not affected by friction and the most precise vials made are capable of detecting movement less than one thousandth of a degree - that makes my 10 minute vial (1/6°) seem rather coarse. Firmly attach a backboard to a wall with a hole drilled into it for adding an axle. In this picture I have a half inch diameter axle that is a snug fit into the hole drilled into the backboard. The backboard is attached to a wall in my workshop with 4 screws. 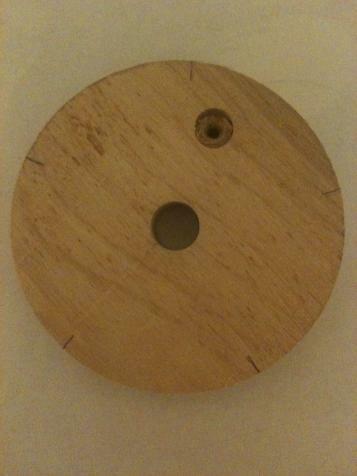 Also shown is a plywood disc that I want to mark with evenly spaced marks around the edge of the disc. The disc has a hole through the center that snuggly fits the axle, and a countersunk screw is holding the disc in place to make sure it does not slip around on the axle. 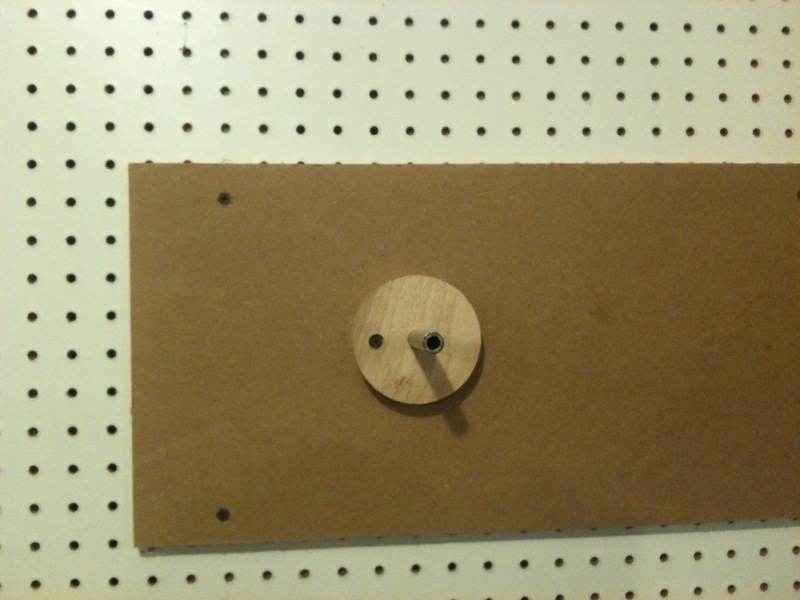 I made a very simple fixture from quarter inch plywood for holding the angle measuring device that has a hole drilled that will be a snug fit over the axle. This piece does not have to be any particular shape or size - the only thing it needs is an edge that is aligned with the hole center that will intersect the edge of the disc. 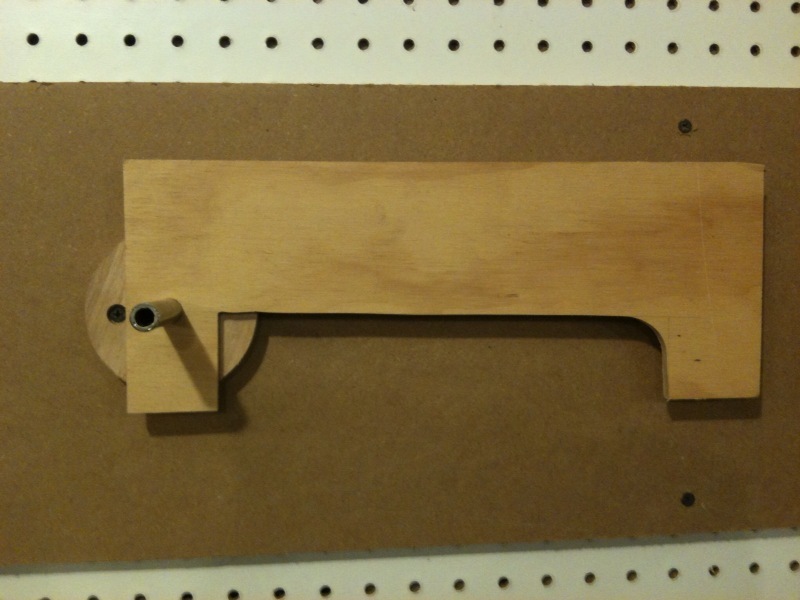 My vernier protractor is made of plywood and I am going to attach it to the fixture with two screws through pre-drilled holes through the outer part of the protractor body. Fancy electronic measuring devices will need a more elaborate method of attachment obviously. Here the device is shown ready to use. Decide where to start with the first mark and set the vernier to read zero degrees, unlock the wingnut holding the vial disc in place and center the bubble and lock the wing nut back down and draw the first mark with a sharp pencil along the edge radial to the center. Calculate the angle between the divisions and turn the scale so the vernier reads that angle and rotate the device until the bubble is again centered then draw the mark. Continue by adding the angle between divisions to the current reading, rotate the device to center the bubble again and draw the mark. Continue in this manner all the way around the disc. The completed disc divided into five equal divisions. Marks were drawn at 0, 72, 144, 216, and 288 degrees. Note that all angles are referenced to the same starting point and this eliminates any cumulative error. Any number of divisions can be drawn onto any size disc using this method. If only one decimal place of accuracy does not sound very good then consider the following: An eight inch diameter disc has a circumference of 25.133 inches, dividing this by 360 gives .0698 inches along the circumference per degree, so 0.1 degree is only .007 of an inch.